Just half a year after their release, the Moto G5 and G5 Plus will each be replaced by new models that bear an S suffix. For this review, we took a look at the Moto G5S Plus to see if the early facelift is justified, or if Motorola should have waited for the right moment before retiring the young, soon-to-be predecessors of the G range. The Motorola G5S Plus is now available in Lunar Gray and Blush Gold for $279 ($229 with limited offer promotion until October 14). The S stands for special edition here. So what’s so special? To find out, we took a look at the changes in comparison with the Moto G5 Plus. And emerging theme across all editions (even non-Plus) with this release is that it marks the end of times when you could get a very decent mid-range Moto G for around $200, and stay happy with its performance two years down the line. Under Lenovo’s leadership, new devices are now being released more often and the device size, specs, and prices are going up. One remaining reason for purchasing Moto G devices is the Android interface it comes with—it’s only slightly modified from pure Android and comes with minimal bloatware. We will list our qualms with the software in a separate section. Motorola finally catches up to the competition and equips its Moto G series with metallic unibodies, crafted from a solid aluminum block. The necessary plastic recesses give room for the antennas, and the display is protected by Gorilla Glass. No full waterproofing here, but a nano coating prevents splashing water from getting in. Compared to its predecessor, the GS5 Plus is by far the most beautiful model of the series. Many here at Android PIT could not believe that this was a model from the G series. Blushing often results from fluffy feelings, and that is exactly what happened when we opened the ‘Blush Gold’ Moto G5S to review. Upon closer inspection, it became clear where the ‘blush’ comes from as its pink tones live up to its name. The phone’s high-quality craftsmanship really shows. During the two weeks I had to review it, I dropped the Moto G5S Plus once onto laminate flooring from a height of about 20 inches, often placed it on the table with the display face down, slid it on surfaces and other mistreatments. It only got a few tiny marks and will probably age slowly and gracefully, mostly on the edges and corners. The G5S Plus’ Full HD on 5.5 inches means you get roughly 400 p that’s more than enough for a viewing distance of about 20 inches. Its display shows true authentic colors and on the hardware side, the brightness and contrast range are good, but are held back by software optimization in the background. In terms of brightness, the Moto G5S Plus is a mixed bag though. It’s adaptive brightness works somewhat too inconsistently and does not darken the display enough in the evening. It also doesn’t brighten the display enough in the sunlight during the day either. As a result, the actual display contrast range’s potential is not really taken advantage of. Deactivating adaptive brightness and activating Night Mode helps remedy an excessively bright display during nighttime reading. Although it is not as elegantly executed as on the Google Pixel, it gets the job done to some extent. The Moto app gives you the option to turn Night Mode off between sunset or sunrise by using your location. Motorola ships the Moto G5S Plus with software that is very similar to Google’s pure Android. The differences lie mostly in apps that are updated separately from the core system via the Play Store. Unfortunately, this does not mean faster system updates though, and the review device ran older software. Like any mobile device nowadays you’ll be doing online banking, shopping and posting online with the G5S Plus so rest assured—it gets monthly security patches from Google. Just not as often as before. It’s okay if it sometimes takes a few weeks. However if it takes say, three months, then you really start to question whether you should be using your phone. Even at the end of September, the test device still ran on Android 7.1.1 with the June security patch. Many competing products with software that have significantly more modifications have more to offer here, and that’s not all. In 2017, it’s now common decency to provide smartphones with at least two years’ worth of operating system updates with new features, and security patches for a third year. As it currently stands, Motorola has ruled out a second operating system update for the G5 series models after the upgrade to Android 8 Oreo. The Snapdragon 625 built into the G5S Plus offers solid mid-range performance that is barely noticeable from the Moto G5 Plus. It’s just agonizing that Asus recently pointed out that its direct successor, the Snapdragon 630 chipset, is currently undergoing mass production. This would have made a big difference for this phone model’s update. One has to wonder, why the 625 ended up here when it would have found a proper new home in the smaller Moto G5S. 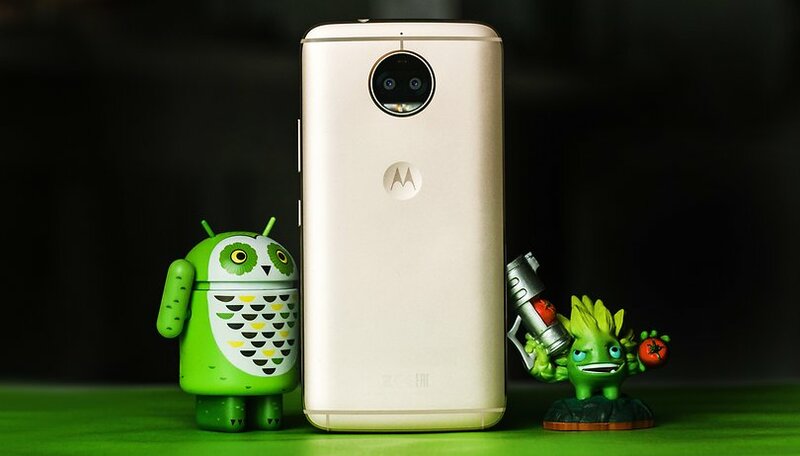 Motorola has passed up an important opportunity to give the Moto G5S Plus a competitive new factor, which would have also been advantageous together with the dual cameras. The newer chipset would have offered some exciting technology for imaging, eliminating some possibilities for the otherwise well-selected hardware. Apart from the processor, the Moto G5S Plus offers 3GB of RAM and 32GB of expandable flash memory storage. Gaming performance is only sufficient for simple games: You will only get good graphics with a Snapdragon from the 800 family or a Samsung Galaxy S7, which is currently available on eBay for the same price. The sole encased loudspeaker directs its sound downwards. There is one microphone on the bottom and one on the rear next to the camera, while the good ol’ headphone port is still there. Motorola does not include any headset in the packaging though. Motorola is taking some bold steps with its rear camera. The G5S Plus’ single camera with a large f/1.7 aperture—which is actually quite good—gives way to two 12-MP cameras with only f/2.0. The only downer is that there is an option of subsequently adjusting your photos’ focal point. Unfortunately, Motorola did not wait for the corresponding optimized chipset, which means that the focus effect will not work as properly as it should. The camera software comes ready for some funny business: It replaces individual depths with other images, backgrounds, or colors everything black and white except on one layer. In theory, it sounds exciting, but falls short in practice due to its flawed depth detection abilities. Individually though, the cameras deliver satisfactory results for both photos and stabilized videos. The selfie cam is the main winner in the evening, primarily because of its flash, and it’s also good against backlighting during the day. Unfortunately, the rear camera is not an improvement over the f/1.7 single camera, therefore it falls short as an effort to improve the previous G5 Plus. The Moto G5S Plus’s battery holds out well for one-and-a-half days and takes a little more than an hour to fully recharge. It is non-removable and contains 3,000 mAh, with battery life being good but not extraordinary. Motorola’s special edition G5S Plus is supposed to be the essential update to the fifth-generation Moto Gs. But competition from phones like the Honor 6X has already set the bar quite high in January—dual cameras, a fingerprint sensor, and strong hardware equipment are now a must in this price category, and Motorola still lags behind here. Now Motorola offers a sleek device, but is moving away (but not quite) from the best bang-for-the-buck category at almost $300. This is bad timing for Motorola. It shows the new Moto G5S and G5S Plus were released too early. They should have waited for the new Snapdragon 630 processor, which would have taken better advantage of the dual camera, and it is frankly dangerous to schedule the release so close to the standard Moto G5. Motorola should expect to lose the trust of buyers that have an outdated device in their hands after just half a year. It’s a sad truth because the Moto G5S Plus is actually a very decent smartphone. But when you look at the competition and its failures in hardware and software, it doesn’t merit that half star to a full 4.